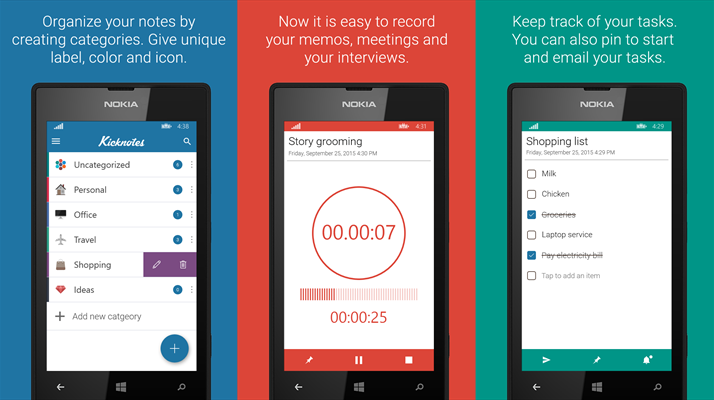 Kicknotes is a new note taking app for Windows Phone from developer XAML Factory, the ones who also make the wonderful Briefcase file manager app. This a sleek, well designed note app with most of the features you would expect from a note taking app. You can organize your notes into categories and assign icons to them. You can then create as many notes as you need under these categories. The app currently supports Financial, Handwritten, Voice, Password, Task Lists and Plain Text notes. The only thing I found missing was the ability to insert an image from the gallery or camera roll. Overall it’s a great initial release. Write notes, checklist, record voice, free draw, store login details and payment details. Never worried about private notes. You can lock your app with 4 digit pass code. Backup your whole data and restore it whenever you want. Protect your backup file with AES-256 encryption. Tired of writing. Just talk. Kicknotes will take care of converting your voice to text. Keep track of your notes by creating reminders. Pin a shortcut of your note to start screen to have a quick access. Email your notes to your friends and relatives. Built-in password generator. Create strong passwords and protect your privacy.